We became an authorized Paul Mueller dealer back in 1986. The Mueller company was a strong alternative to having a single vendor providing all milking parlor solutions. Sometimes mixing and matching works best for certain solutions. 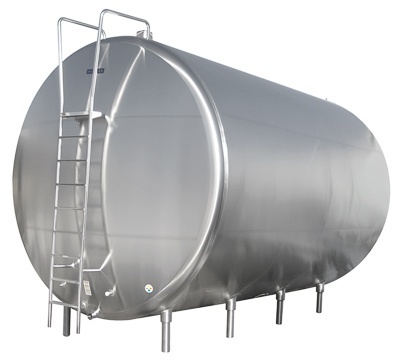 Their milk storage tank options offered us an advantage over others when we needed to customize installations. The Mueller refrigeration units are world renowned and some of the best refrigeration equipment on the market, bar none. The Cooling Solution consists of five main aspects: pre-cooling, storage, tank cooling, heat recovery, and wash. Pre-cool your milk within 2 degrees of your well water temperature prior to storing in the Mueller Milk Cooler. For traditional-milking farms, the best milk cooling solution is what Paul Mueller Company set out to accomplish in 1955. With 63 years of experience under their belts, they have perfected a system that is ready to work long and hard for your farm. The OH Milk Cooler has high functioning controls that withstand the rigors of dairy use. It has the entire CIP system and modular outlet valve assembly from Paul Mueller Company. This unit allows you to focus on other aspects of the milk cooler installation and leave the cleaning to us. The Mueller E-Star HiPerForm EVC Refrigeration Unit (condensing unit) has proprietary technologythat has historically made it the most energy efficient milk cooling system in the world. Mueller silos provide the ultimate in product protection during storage and their vertical design allows maximum product storage in a minimum amount of space. Mueller is the only silo manufacturer to take the time and absorb the expense to offer a stud-welded, circumferential banded bottom construction which protects against fatigue. Mueller offers “DSV” silos in 7 sizes ranging from 7,000 to 30,000 gallons for your convenience. What do you want me to say? Avila Dairy Equipment is awesome because of Mr. Richard Avila that is a badass & takes care of customers’ milk barn problems 24/7. He is very tactful & becomes your friend shortly after you meet him. He shows that he cares & feels your pain. He makes things right if there has been a mistake or issue with any of his or his employees work. He answers and or replies to customers calls any time of day. He can’t sleep until the problem is fixed.